The School of the Art Institute of Chicago (SAIC) remembers the life and legacy of alum and Chicago Imagist Roger Brown (BFA 1968, MFA 1970) on the 20th anniversary of his death and remarkable bequest to SAIC, which continues to educate and inspire students today. Brown began the process of donating his homes, studios, and collections to SAIC in 1995, with the gift of his property in New Buffalo, Michigan. Designed by his partner, architect George Veronda, the pavilions are modernist structures containing furnishings designed by Veronda and an outstanding art collection assembled by Brown. The facility is used as a retreat for SAIC faculty and staff. With this gift, reflecting his own experience, Brown offered fellow artists an ideal counterpart to the stimulation of Chicago’s urban environment in a secluded Lake Michigan dunes landscape. In late 1996 Brown gave his seminal Chicago collection of art and objects, now known as the Roger Brown Study Collection (RBSC), to SAIC. For Brown, assembling and living with a panoply of visual things was essential to his working process, and he assembled a world of objects and images from the far corners of the world of art making. The collection is preserved, intact, as a historic house museum, in Brown’s former home and studio. The RBSC has astonishing range of objects, including works by Chicago Imagists and other contemporary artists, self-taught artists, folk and tribal art, material and popular culture, costumes, travel souvenirs, and other things Brown surrounded himself with for artistic inspiration. As a special collection the RBSC allows students to explore and participate in all aspects of the care, organization, interpretation, and preservation of a vast collection of art and artifacts in a 19th century storefront building. 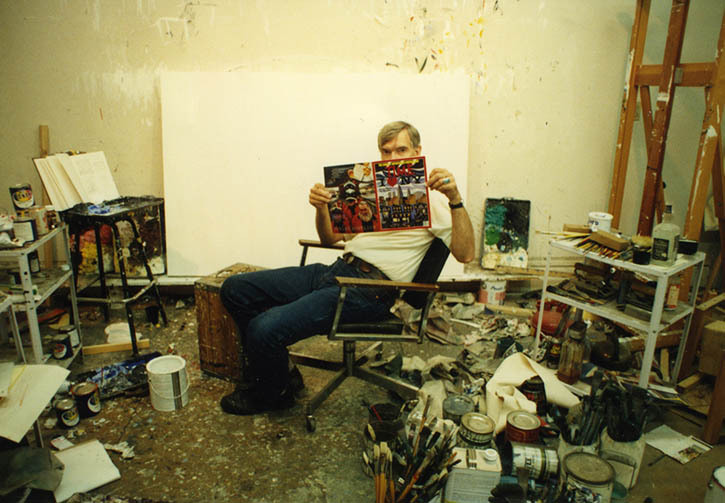 When Roger Brown died on November 22, 1997, from complications of HIV/AIDS, he made a major bequest of his California home and collections, and his entire painting collection to SAIC. Brown did not teach at SAIC during his lifetime, but through his remarkable gift, he has taught SAIC students for 20 years.